In 2014, we took a walking holiday in the lovely Spanish village of Mairena on the southern slopes of the Sierra Nevada. What we found was everything we had hoped for – a warm welcome, tranquility, good food, lovely people and lots to explore. We so fell in love with it that we hatched a plan with our hosts and owners of Casa Las Chimeneas in Mairena, David and Emma Illsley, to put on some food and travel breaks so that you can discover this timeless region of Spain for yourselves. Mairena is in the Alpujarras, a fertile region to the south of the Sierra Nevada. It is little changed and many of its residents still follow a very traditional way of life. You’ll gain an insight into that life and enjoy the wonderful bounty of the region when you join us for a 1 week break. Our next trip is autumn 2019; we can’t wait to return and we’d love you to come with us. Just give us call and we can book you in – 01803 752943 or email us on info@mannafromdevon.com. The week is £975 per person and you can secure your place with a non-refundable deposit of £250. (Please see our Terms & Conditions and ensure you have travel insurance in case you have to drop out of the week). What’s covered – pick up from Malaga airport; accommodation; meals at Casa La Chimeneas; all activities. What’s not covered – your flights to Malaga airport for a noon arrival on the first Saturday and a 10.30am drop off on the departure Saturday; your drinks bill; meals and snacks outside Casa Las Chimeneas (we’ll collect a kitty to cover these of 60 euros per person); travel insurance. These itineraries may change with weather and availability of hosts but all the main elements will remain in place. October can be one of the very best months to visit. Sunny and clear during the day, with a pleasant temperature, and cool at night. 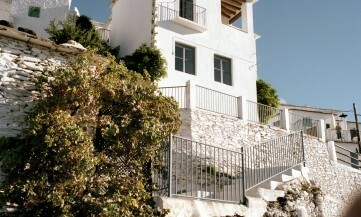 Arrive Malaga Airport by noon for 1pm transfer to Casa Las Chimeneas, Mairena. Welcome drinks and dinner. Walk in the hills surrounding Mairena with a picnic lunch. Visit to local vineyard and bodega for wine tasting of local wines followed by dinner at Las Chimeneas. Hands on cooking class of typical Andalucian Tapas with Holly, Louis and the Las Chimeneas cooks, Sole and Conchi. Afternoon walk followed by sherry tasting and dinner. Walk to the Las Chimeneas Finca (small holding). Explore the olive groves before a flat bread and al fresco cooking class before lunch. Visit the local olive oil mill before dinner. 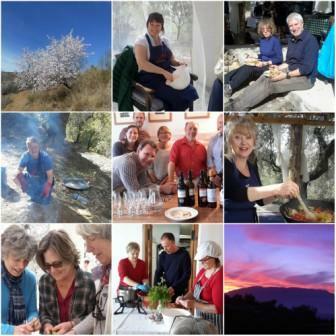 Visit the Western Alpujarras for a day at Cortijo Opazo where we’ll have a woodfired oven lesson, cook lunch and enjoy this stunning garden created from the wilderness. Morning visit to the local jamonerie followed by lunch from the woodfired oven in Jubar (weather dependent), an afternoon walk for those who will and then an olive oil tasting before dinner. Morning hands-on baking workshop with Holly and Louis followed by lunch. Afternoon walk through the olive groves before a final dinner. Transfer to Malaga for 10.30am drop off. Head home via Malaga airport. Thanks again for a terrific week. It was everything I was hoping for and I thoroughly enjoyed my time with you. Hopefully I’ll be able to join you down in Devon sometime for another taste of Holly & David’s perfect manna! All the best, Fiona. Thanks again for all your work for the cooking week at Las Chimeneas. Jane and I had an extremely enjoyable and informative time. Good luck for your future plans. Best wishes, Steve and Jane.